The UK Home Built Boat Regatta foregathered at Barton Broad on Saturday, and I tagged along with my newly painted Nessy, a Sandpiper designed by Conrad Natzio. I've converted her for rowing, though an auxiliary sailing rig will also be provided when I get my act together. 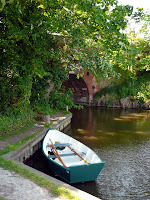 On Saturday I rowed up the River Ant to Dilham, a very narrow and winding river. At Dilham it comes to an abrupt end at a hump-back bridge with intimidating notices to the effect that from there on is a private dyke. In fact, it only continues for a few yards so it's not worth your while trespassing. 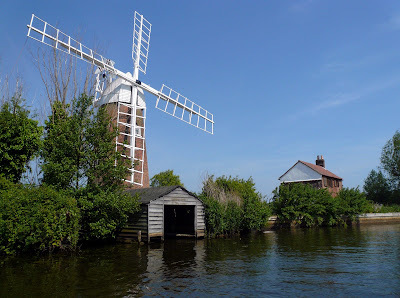 On the way is a delightful boathouse at Hunsett Mill, one of the classic photo opps in the Broads. The miller's house is due to be extended and the boathouse replaced by a similar but subtly different version, for which planning permission has been given. Work has already started. The effect is to replace an aging structure with a new version more fit for purpose in the 21st century, which can only be good.